You are here: Home / Editorial / History / Places / EL MIGUELETE…STUNNING VIEWS OF VALENCIA! Other cities have glass skyscrapers from which to view the city but Valencia’s towering icon is ‘El Miguelete’. 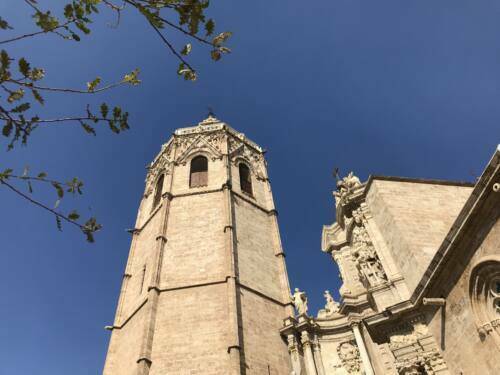 At one end of the Plaza de la Reina, in the Valencia Cathedral, you can walk past the nun manning a sort of gift shop and pay two euros to climb the Gothic cathedral. It took four centuries to build and was the tallest building in Valencia into the 20th century. The stairs of the tower are narrow and steep, not meant for the physically challenged or the claustrophobic. The walls are scratched with illegible variations on “I was here”, from the 16th century onwards. At the top, you and fellow climbers spill out into the sunlight of an observation deck. The surrounding walls are topped with wire grid— an annoyance to aspiring photographers but understandable for safety. If you are lucky enough (or unlucky, depending on the sensitivity of your ears) to be at the top at the turn of the hour, you will be treated to the voice of the Miguel of the Miguelete — five centuries old, as tall as a man and only a few feet above your head. A little bell above it rings first, leading you to think, “Oh, that’s not bad at all,” right before the Miguel resounds its first BONNNGGGG through your eardrums. The whole city can be seen below. There, the extraordinary roof of ‘El Mercado Central’ and there the Torres de Serranos. On the other side of the Miguelete there are the silhouettes of the City of Arts and Sciences and the cranes of the docks. Is that the sea beyond them, or just the hazy underside of the clouds? Except for the high hills to the southwest there seems to be nothing besides the city stretching to each horizon— a reminder that, while Valencia may not be the largest city in Spain, it is still huge.